K. Denney, A. S. Uluagac, K. Akkaya and S. Bhansali, “A novel storage covert channel on wearable devices using status bar notifications,” 2016 13th IEEE Annual Consumer Communications & Networking Conference (CCNC), Las Vegas, NV, 2016, pp. 845-848. A. S. Uluagac, V. Subramanian and R. Beyah, “Sensory channel threats to Cyber Physical Systems: A wake-up call,” 2014 IEEE Conference on Communications and Network Security, San Francisco, CA, 2014, pp. 301-309. Guard Your Gadgets: Channel 7 covers our project in evening news on November 11, 2016. Dangers of Unsecured Surveillance Cameras: NBC 6 news highlights a news featuring unsecured surveillance cameras where Dr. A. Selcuk Uluagac talked about how camera sensors can be hacked in surveillance cameras. 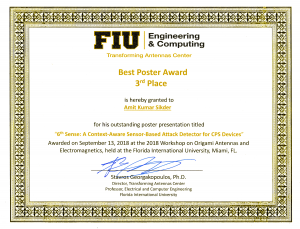 Amit Kumar Sikder, H. Aksu, and A. S. Uluagac, 6thSense: Sensor-based Attack Detector for Smart Devices, Technical Presentation at Graduate Student Appreciation Week (GSAW) in Florida International University, Miami, 2017. Amit Kumar Sikder, H. Aksu, and A. S. Uluagac, 6thSense: Sensor-based Attack Detector for Smart Devices, Technical Presentation at 26th USENIX security symposium, Vancouver, Canada, 2017. Amit Kumar Sikder, Abbas Acar, Leonardo Babun, and A. S. Uluagac, Experts talk cyber attacks on business, lead live ‘hack’, Workshop on cyber security leadership and strategy, hosted by Florida International University, the U.S Chamber of Commerce, the Florida Small Business Development Center Network and the Greater Miami Chamber of Commerce. 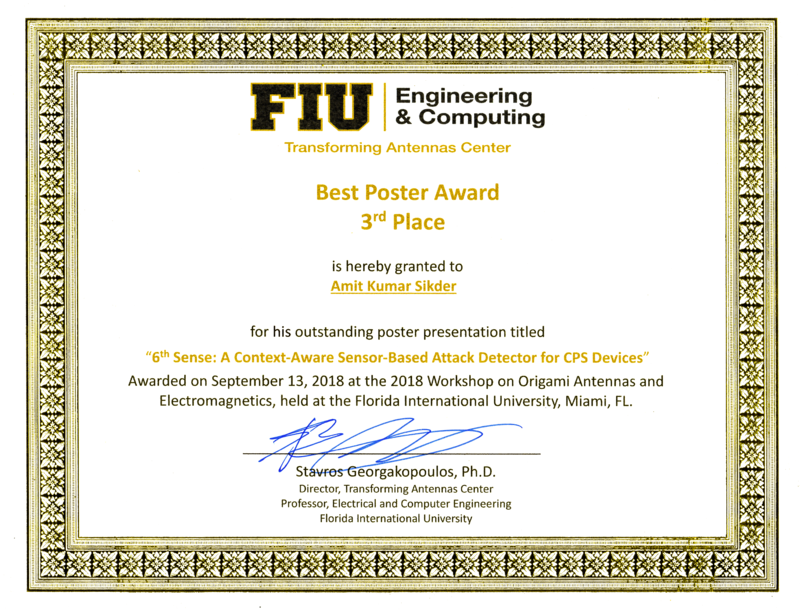 Amit Kumar Sikder and A. Selcuk Uluagac, “6thSense: A Context-aware Sensor-based Attack Detector for CPS Devices”, Poster presentation at Transforming Antennas Center workshop, hosted by Florida International University.